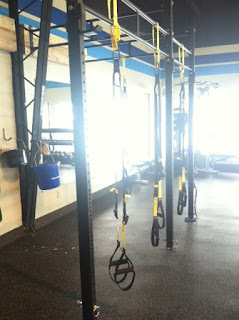 It seems like everyone I meet in Boston is somehow involved with CrossFit. I am always hearing what a "wicked" good workout it is, once you start you'll never stop, it is like a 'cult' of workout groups... you name it. So I decided I wanted to see what this fuss was all about... and today was finally the day I got to try it! ....... And yup, now I know exactly why everyone loves it. Dang it, I might just have to become a CrossFit junkie. I LOVED IT! This is about to be another one of those "TRY SOMETHING NEW" blogs! You never know what you might like and it is always so refreshing to switch up your workouts! 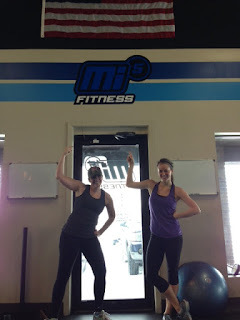 Lucky for me, my Aunt Sarah goes to CrossFit and insisted that I tag along (if you read my blog, you know how I'm a huge believer in finding a workout buddy!). We attended an 8am Saturday class, which is geared more toward a bootcamp, compared to a 'normal' CrossFit workout that targets heavy lifting (according to awesome Trainer Andrew). 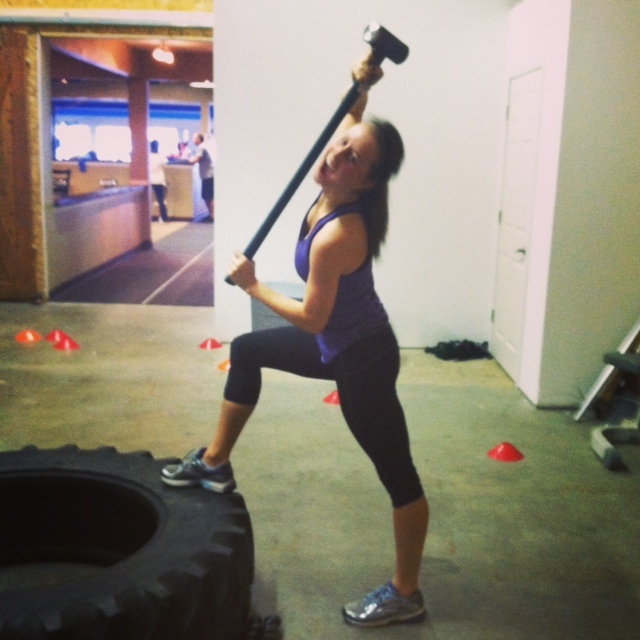 Before ever attending CrossFit, I was paranoid that I wouldn't be able to handle it. Everyone I know that does it is ripped out of their mind and surely does 100lb bicep curls... while I'm still hangin with my cute little 12 pounders. Wow, was I wrong. Listen to me loud and clear: Every accomplishment begins with the decision to try! Every single circuit had a huge variety of weights, and the trainers had modifications for newbies or people working their way up to the "buff" stage. Trust me, you can handle it! 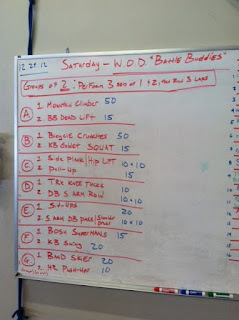 Today, the workout of the day was "Battle Buddies", where you had a workout partner to make your way through 7 stations. 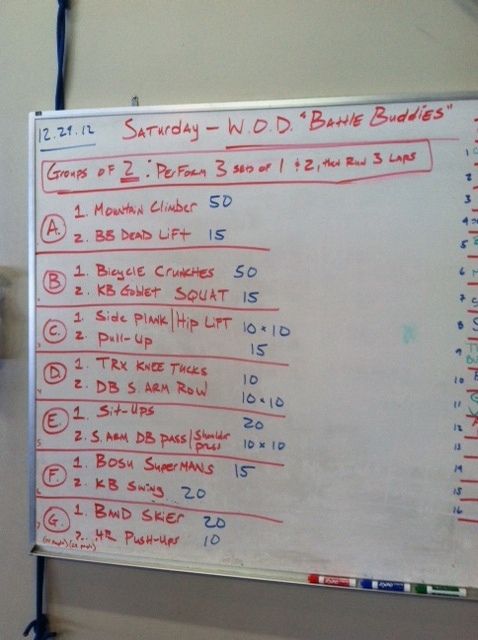 There were 2 workouts at each station and you had to do 3 sets of each. After completing that, you finished the circuit by running 3 laps (gotta keep the heart rate up) before moving onto the next one! 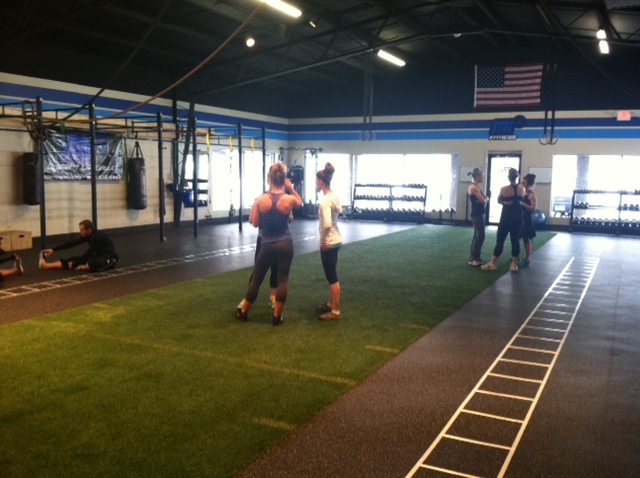 At the beginning of every class, the trainers demonstrate each workout and answer any questions. Signs at each station remind you of how many reps to do, and the trainers constantly help you fix your form and improve your technique. It was GREAT! This workout included everything from pull ups, bosu supermans, squats, push ups, shoulder press passes, mountain climbers, kettle bell swings and squats, bicycle crunches, hip lifts, etc..... obviously targetting our entire body. Talk about a good workout! It took Sarah and me 45 minutes (rock on girl!) and the purpose of the workout is to hopefully improve your time next time! Honestly, it was a tough workout. 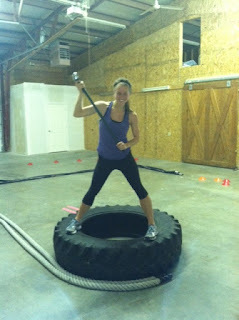 Not nearly tough enough to give up (there is never a good reason to give up), but I had a good sweat going! Sarah and I had to motivate at each other at different parts of the workout so that we would finish strong! Which is exactly why there is nothing better than a workout buddy. Not to mention a professional snowmobiler was working out with us... awesome reason (and eye candy) to push through it. I was huffing and puffing by the end, but who ever said a workout was supposed to be easy? No pain, no gain. 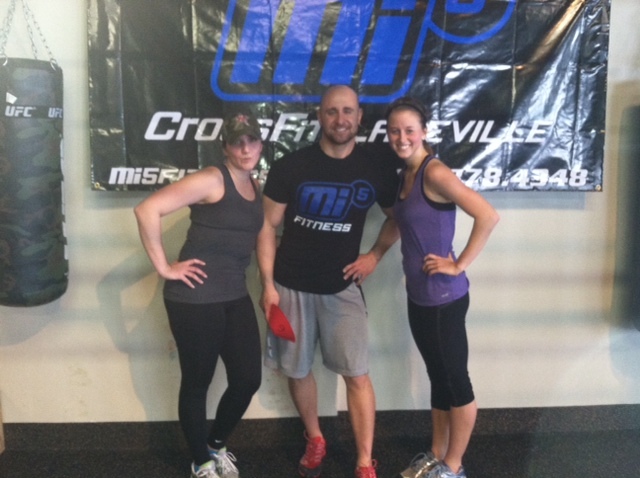 Thanks to Andrew at CrossFit Lakeville for a killer workout and helping to whip me into shape! Can't wait to go again on Monday! That is all for today, folks. I hope I have inspired you to give CrossFit a try, or at least try something new! I can guarantee you won't regret it. 2013 is right around the corner... where are you going to take your body this year? Give it all you got! And don't forget a healthy diet is CRUCIAL if you want to accomplish your goals. My blog is filled with healthy recipes and motivational tips to help you- check it out! It’s true. CrossFit can get your body going, your muscles flexing, and your blood pumping. It’s a tough workout, but the positive effects can outweigh all its accompanying hardships. That is reward in itself. And you are correct: a good diet is needed for it to work effectively – it’s not enough that you just work out. Being healthy is not just about being physically fit outside. Thanks for sharing!